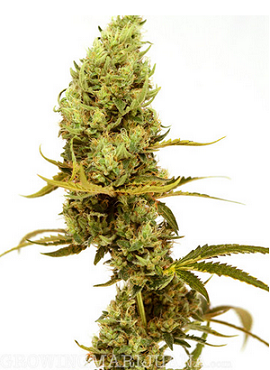 Gold Leaf seeds are a perfect blend of 40% Sativa genetics combined with dominant 60% Indica genes. Refined over generations, these spectacular Marijuana seeds created by Robert Bergman himself, produce a tall, Sativa-style plant, with big yields of extremely strong Marijuana buds. If you are planning to grow Marijuana outdoors this Summer, this is a great choice. Grown without restriction Gold Leaf seeds can grow as much as 225 cm tall, a real monster! Gold Leaf Seeds can also be grown to their full potential indoors, although pruning and cropping techniques are advised to manage the overall height. Although Gold Leaf seeds are predominately Indica, it’s the Sativa heritage that produces this incredible stretch in height at the beginning of flowering. It’s this stretch which produces the long, swollen cola’s, producing dense buds and heavy yields covered in golden yellow hairs. Even grown indoors Gold Leaf seeds perform well, producing between 450 and 650 grammes of pungent bud per square meter. Flowering times are relatively short at approximately 63 days required for the plant to completely mature. The marijuana plants produced from Gold Leaf seeds have a high THC level, approximately 21%, producing a relaxing, euphoric high great for relieving anxiety, tension and stress. Sold in complete packs of 5, 10 and 20 Gold Leaf seeds, you can enjoy these female-only, feminized Marijuana seeds with guaranteed delivery and germination. Postage and stealth packaging are free, so take advantage and buy Gold Leaf seeds today.